00:40:00 Makes 4 servings, 3 meatballs (239 g) each. Makes 4 servings, 3 meatballs (239 g) each. 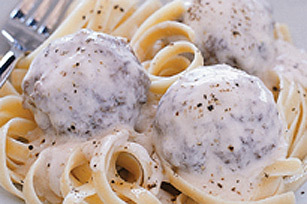 These beef meatballs are served with a creamy mushroom sauce. The recipe makes a double batch so you can freeze half for another meal. Mix 3/4 cup water and 1/4 cup soup in large bowl. Add meat, dry stuffing mix and eggs; mix lightly. Divide meat mixture in half. Refrigerate half the meat mixture up to 24 hours. Shape remaining meat mixture into 12 balls, each about 1-1/2 inches in diameter. Place, in single layer, in shallow foil-lined pan. Bake 20 min. Mix remaining soup and sour cream in large saucepan. Add meatballs and remaining water; cook on low heat 10 min. or until heated through, stirring occasionally. Plan ahead! Shape reserved meat mixture into oval loaf on foil-covered baking sheet . Refrigerate up to 24 hours. When ready to serve, bake, uncovered, at 400°F for 40 min. or until done. Serve as part of your dinner the next night. Remaining meat mixture can be shaped into more meatballs and baked as directed. Cool, then place in airtight container and freeze until ready to use as desired. Serving Size Makes 4 servings, 3 meatballs (239 g) each.